Well, hasn’t this past week been a big one? Bulgaria are back in Junior Eurovision (*insert fist pump here*), Eurovision has a new but not-necessarily-improved generic logo (I’m still pulling a Bucks Fizz and trying to make my mind up about it) and we still don’t know which Austrian city we should start familiarising ourselves with. In case the EBU happens to make that known between now and my next post, I’d like to say that I think Vienna will give us an amazing show. As long as it’s hosted by Conchita Wurst and Inspector Rex, that is. You can’t tell me they make an unattractive pair. I would also like to say a haa-yuuuge thankyou for the lovely comments made on my last post. They were just the kind that make me feel all warm and fuzzy and remind me why I love to blog, ESC-style. To kick off the week, I thought we could indulge our catty sides and “throw some shade” or whatever it is that the youth of today harp on about. 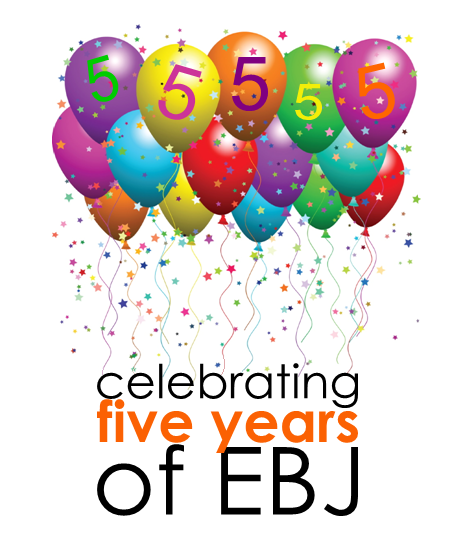 This may be the second post in my 5th birthday series, but why should they all be celebratory when it’s so much fun to discuss the good, the bad and the ugly of Eurovision? …but deep down we’re all aware that occasionally, the contest stage is overtaken by crap. When you’re doing your yearly rankings, there are songs that will be at the bottom. Personally, I tend to hate some entries with a passion initially, but by contest end find them listenable – which is why it’s taken me so long to find a legit list of songs that have made me go ‘NOPE!’ since I began this blog. Many of these are more dull than they are crappy, so I wouldn’t actually give them all zero points if I had the chance. But the following ten songs would bring up the rear of my 2010-2014 rankings. You know the drill. Check ’em out, then let me know which songs of the last five contests have had you hitting the nearest mute button! Sometimes I wonder if it’s better for an entry to be so bad that nobody can stop talking about how bad it is – rather than so dull that nobody EVER talks about it. I present to you now Exhibit A, being mentioned perhaps for the first time since it (unsurprisingly) failed to qualify two years ago. I don’t hate this song, and I definitely don’t hate Iris – in fact, many of us had big hopes for her prior to her song being chosen – but that’s the problem. I have zero strong feelings about Would You aside from a very strong urge to yawn whenever I hear the opening bars, because I know what’s coming. I.e. three minutes of slightly disjointed nothingness. Yep, more yawns are a-comin’, people! The second-ever entry from our favourite tryer San Marino was so inoffensive it hurt. Again, it wasn’t horrible by any means, and Senit did the best she could with the material at hand, but I direct your attention back to what I said about Belgium ’12 in this case. Stand By was more cohesive than Would You, but no more interesting and just as zzzzzzzzzzzzzzzzzzzzzzz *falls asleep in the middle of writing about it ‘cause it’s that bland*. If you’re craving something savoury right about now, you may enjoy this massive hunk of cheese I’m about to serve up. Actually, I shouldn’t take credit for what was a Maltese creation back in the days of Düsseldorf, particularly when the quality of said creation is so questionable. You’ve got to love Glen himself – one of many congenial, happy-go-lucky peeps to represent Malta in recent years – but if you also love the stale pop of ‘ooooooonnne liiife’, may I ask why? Did you hop in a time machine pre-Eurovision 2011 and go back to 1988 only to find this entry cutting edge? Or do you just hear something in it that I don’t? Georgia seem to pattern themselves like this: one year they’ve got their game faces on and come to the ESC armed with a contender more often than not purchased from the Swedish Song Supermarket (owner and proprietor Thomas G:son) and the next, it’s bonkers o’clock and the nonsensical rhyming lyrics and parachutes are out in full force. The cray cray may work to their advantage in Junior Eurovision, but I’m afraid I don’t enjoy it elsewhere, as much as I admire how they embrace all that is wack. I’m A Joker was a mash-up of about five different songs that was well handled by Anri, but the man deserves something infinitely better to test his impressive vocal range on. Last year, Despina was itching to know if we remembered her. If that’s not irony, it’s right there in that neighbourhood given how utterly unmemorable her song was. Bring this entry up in conversation and the first thing that will pop into my mind is her faux-transparent lace gown, which I rather liked. Apart from that, I’ve got nothing. In that sense, I’m kind of glad Cyprus chose to take a year out of the competition. I hope the holiday has revved them up to find something that excites for Vienna/Graz/Innsbruck (come on EBU – put us out of our misery!). I can feel the burn from the evils y’all are giving me, and I’m sorry, but everyone is entitled to their opinion…mine in this case being that this song is so freaking annoying, it actually gives me a headache. Now, I will admit that there are rare occasions when I can tolerate it, but I have to be in the most carefree, hormonally regular state of being at the time. If not, the mere sound of that screechy chorus sends me into a rage that ends in either me tearing my hair out, or tearing out the hair of anyone who happens to be within clawing range. Unless it’s Cristina Scarlat, who has no hair left to tear out. LAME LADY BALLAD ALERT! Why, oh why are we still being plagued by these atrocities? Russia, just one year ago, gave us the most recent example, and in fact, there are a lot of similarities between What If and My Dream. ‘Youthful, talented female sings cringe-worthy ballad while dressed in her grandmother’s curtains’ pretty much sums them up. What saved What If from appearing on this list was the construction and the melody, neither of which are presented in quite the same dated, clichéd manner of Malta 2010. Let’s hope the island nation is done with cheese like this, and what came immediately afterwards. Some unusual pairings just work – for instance, chocolate and popcorn, or Danny DeVito and Arnold Schwarzenegger in Twins (oh, the LMAOs!). Perhaps even folk and rock music can result in a pleasurable listening experience when combined in the right way. Unfortunately for Slovenia in Oslo, their experiment in genre fusion failed. This is another song that I find extremely irritating, and frustrating at the same time because I feel like three minutes of the folk would have been so much better. The painfully vintage rock stylings I can do without. Disclaimer: I know I’m repeating myself, but I’m not trying to insult the artist here. Evelina has a great voice and is probably a top-notch human being. Sadly, the overblown, melodramatic and depressing B-side from Les Misérables that she was forced to sing at confetti cannon-point competing with was a big distraction from those positives. This style of song just doesn’t appeal to me at all, especially in the Eurovision context. And I feel like I’m perfectly at liberty to say that, as compensation for it going through to the final when I really didn’t want it to. My opinion of this entry in a nutshell? WHAT were they THINKING?!? It’s like the kid at school who never even had a chance because not only does he have a stutter, a limp and a lazy eye, but his parents also named him Buttcrack. What I mean is, Pete Waterman set what was already a laughing stock of a song up for the ultimate fall when he decided to call it That Sounds Good To Me. Josh was/is adorable, but not even he could save the UK from humiliation, and his bum note right at the end of his performance in the 2010 final was the cherry on top of the world’s worst sundae. I can’t even laugh at it because I feel so bad for him. Okay, maybe I can laugh a little. Sorry Josh. If you’re like me and aren’t a fan of these songs, I apologise for bringing them up. But really, we should be thanking the writers and composers who were clearly having an off day, because what is good without bad? On the other hand, if you’re outraged that I dared rubbish the masterpiece that is That Sounds Good To Me, let me know below. Hit me up with your personal nul-pointers, 2010-2014! NEXT TIME: Inspired by the injustices of the Barbara Dex Award, I’m going to have my say on the best and worst fashion moments from Eurovision’s last five years. Dust off your Fashion Police uniforms and join me, won’t you? Posted on August 5, 2014, in Random Stuff, Top 10's and tagged bad, boring, ESC, Eurovision, Josh Dubovie, nul points, top 10, worst songs. Bookmark the permalink. 14 Comments. Other than that, you most certainly redeemed yourself with the rest of the top 10!! Georgia 2012 is by far one of the most hideous entries to have ever plagued the Eurovision stage. Same goes for Malta 2011 and UK 2010: terrible, the lot of them!! So glad I'm not the only one who hated Israel 2012 too!! I will concede that ‘Stand By’ is classy…but more often than not, ‘classy’ for me is code for ‘boring’. Unless we’re talking about Italy, for some reason. I’ll give you Despina if you give me ‘So Lucky’ (LOOOOVE it…nothing beats the grandmamma on the drumma of course, but I adore le quirk). I still have mixed feelings about ‘Birds’, so I can’t say it pains me that you’d have it in your bottom 10. I reckon if you played that to someone standing on the edge of a cliff, they’d throw themselves off it before Anouk even got to the first chorus. I think this is a case of sorry, not sorry, I’m afraid!! I actually like the fact that people can have such opposing, strong views about the same songs though. I think you’re being quite generous with the word ‘song’ when referring to Ireland ’08. That was just noise. If I wanted a puppet shouting at me I’d watch Sesame Street with the TV on full volume. Whoa, Jaz, you’re on a roll! What happened to the more leisurely pace of your posts? Makes it hard for us all to keep up. Chill. And ease up on the No-Doze. Anyway, a lot of overlap in our lists, otherwise lots of nodding, and just one quibble. #08 – Wild Soul, Cristina, Moldova, 2014. I didn’t really want to include any from 2014, it was such a great year, but this one I did find a tad too dirgy. #07 = Your #06 (Despina 2013) – Would it unfair to observe that she may once — prior to a LOT of work — have been a Desmond (not that there’s anything wrong with that)? #05 – Vida Minka, Filipa Sousa, Portugal, 2012. Lisbon lift muzak. #03 = Your #05 (Izabo 2012). #02 – I’m Still Alive, TWIINS, Slovakia, 2011. #01 = Your #03 (Narodnozabavni, 2010). My quibble is another one that won’t make me popular — I have to confess that I actually liked the Joker (your #7), esp. the studio version (hard to convert to the stadium). It was fun, it was cheeky, he had energy, and self-deprecation, it had a pulse, and a bit of syncopation … But I know I’m not going to convince anyone, so I’ll shut up. I secretly have the same thoughts re: Despina. And yet she still looks better in a lace dress than I do. I don’t know how to react to that. You’re not alone in appreciating the Joker, believe it or not. It has its pros, and you made a good case for it, so don’t feel the need to shut up! The fact that it didn’t qualify (which pleased me) means I can hear people praise it without biting back. “Narodnozabavni Rock” aligns with my twisted sense of humor so perfectly that it’s one of my top 10 favorite Eurovision songs of all time, and on heavy rotation in my iTunes for the 4th year running. Oblivious Eurovision parodies are the best Eurovision parodies. “Josh Dubovie’s HORRENDOUS backup singers deserve quite a bit of the blame for that trainwreck. I can’t believe they actually found five people in the UK with “Backup Singer” on their resumé who were capable of singing that badly.” THIS. SO MUCH THIS. I mean, I don’t imagine in-tune backing singers would have made much difference on the whole, but the awful ones Josh got stuck with made the package that much more laughable/painful. Oh, la coco-dance. I’m not sure I’d have wanted to stick out the entire three minutes either. hope you are right with that funny “presenter” team for Vienna ;-)! 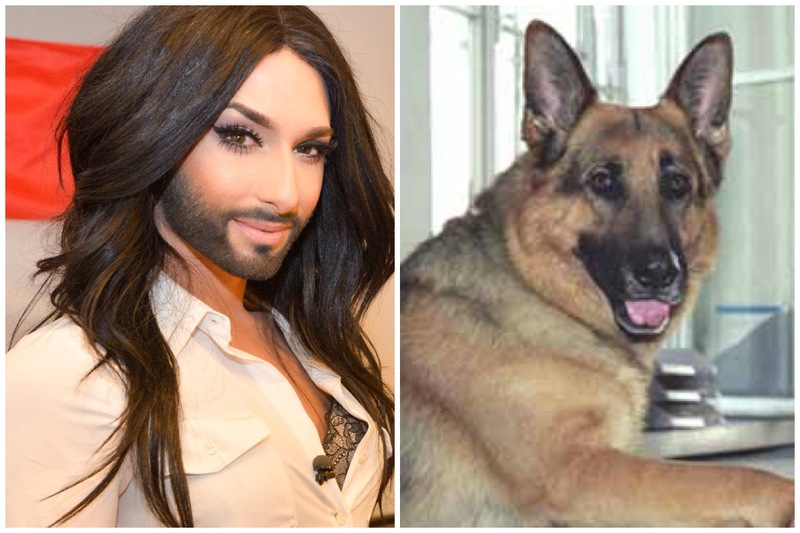 They look amazing together, and who else could join Conchita on Eurovision stage better next year??? I think Inspector Rex looks much nicer than Christoph Waltz would, doesn’t he! This time I am not so much following your opinion with the nul-pointers! I liked Despina, Thea, Senit, Iris and Glen Vella; they all had just dated to boring songs that could not compete in the contest. But they all were worth their three minutes on Eurovision stage, IMO! I think these entries all deserve at least my “zero” points, if not “minus douze” ;-)! But my personal “worst entry ever” at the Eurovision is also Ireland (2008)! If I think of really bad entries where nothing was good at all, this one always comes to my mind immediately. Thank you for that funny post and I am really curious about the “dresses” next time! Maybe Christoph Waltz could host the green room?? I like him too! But Rex would look super dapper in a tuxedo. Don’t get me wrong, I think basically everything is worth the time on stage…mainly because the lowlights make the highlights even better. There’s an audience for the songs that I don’t like for sure! And just as you disagreed a lot with my list of worsts, so too do I have to disagree with quite a few of yours. I love Moustache and Igranka (although I’m not shocked to see that there) and rather liked Identitet and even (shamefully) Woki Woki Woki. It’s a good song to exercise to, I have discovered, so it does serve some kind of purpose. I don’t mind Portugal 2011 either. But Montenegro absolutely had the worst song of 2012! Dustin the Turkey must be feeling very unloved right now. Didn’t I tell you that I hate animals and/or twins on Eurovision stage no matter for what country they perform :-)! So Dust(b)in the Turkey should feel very unloved, at least by moi! And I must admit I cannot say what was more ridiculous, this song (???) or the Irish commentator on Eire TV who really thought Ireland could go through to the final with this catastrophe of a presentation! I couldn’t stop laughing about that man for about 20 minutes ;-)))! I cannot imagine another Eurovision entry worse than that! I apologize for this awwwwfuuuul song and performance which I always feel ashamed of because it is a Siegel / Meinunger composition, and the worst I could ever think of! It is an unsolved mystery to me how this song was pointed into the Top 10 by the juries, they must have been blind and deaf that evening?! Any explanation for that?! What “Woki Woki” exercises do you mean? Is there any video or foto footage ;-)! I’d like to see it, just to get what you mean! And what does your dog say to this?!? And yes, you are right: everything is worth the time on stage, as long as you have a remote control nearby to turn down (or up) the volume! Okay, so NO animals or twins for you. Got it. I’d agree with you for the most part on the animals (puppets? Cardboard cut outs?? No thankyou!) but I have enjoyed most of the twins. I would have loved to have heard the commentator’s reaction to Dustin not qualifying (how very unlikely that was…not) if he was so convinced it had a chance. I remember actually worrying myself that it would go through and steal a spot from a legitimate song not manned by a guy with his hand up a turkey’s bum. Thank god that didn’t happen. I don’t think anyone would blame you for Siegel and/or Meinunger, so don’t worry!! And as for that explanation…I got nothing. Hahaha, I just mean that the Woki has a good tempo for walking to!! That’s a redeeming feature for everyone who hates it. 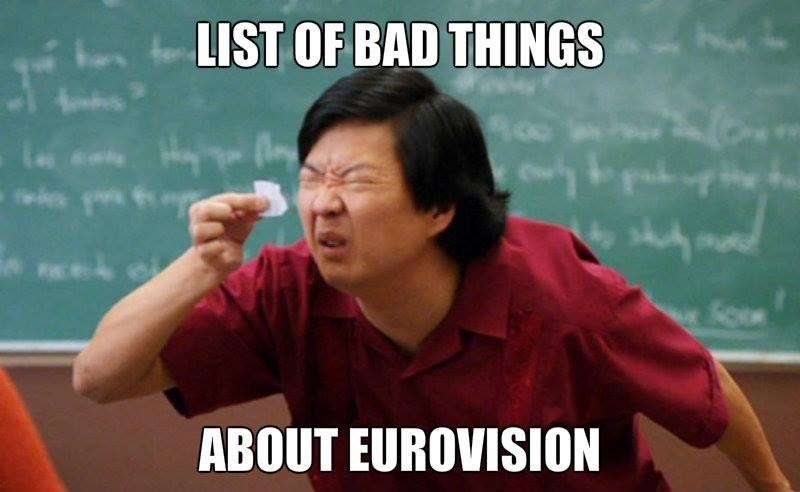 Well, my volume is always on full blast when there’s anything ESC-related on the TV, but I enjoy complaining about the stuff I dislike so I need to hear it! XD But the existence of the mute button is a nice bit of security just in case. Ooops-i-daisy! When I suggested Monsieur de Saade had ‘shades of Ireland 2006’ (Mr Kennedy, and his less-unworthy 1000th ESC song), I obviously meant Ireland 2005 (the ill-feted McCaul siblings), the common qualities being inane, hyper-active, out-of-breath, formulaic repetitiveness. The noughties were such a blur, really. Sorry for any confusion! Can’t say I did notice that! I just think Ireland should be eternally embarrassed that they chose that to represent them.